Don't waste time sending out marketing messages that won't make it to their intended recipients: Use the accurate, up-to-date contact information in this German email list to make direct connections with key players who are likely to buy your products or services. The German economy is strong, and that means that there are plenty of business opportunities to be found here. But they're not going to just come to you: You need to go out and find them, and that's where we come in. At Bookyourdata.com, we specialize in helping businesses to get the sales leads they need quickly, so they can skip the data-gathering stage and go right to making B2B connections and closing deals. Download this premium Germany mailing list today and you'll be one step closer to success! 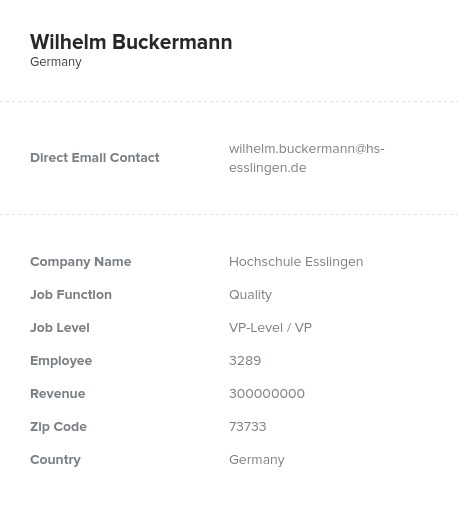 Our human-verified German email database contains only accurate, up-to-date information about the people most likely to buy what you're selling, including their real names, job titles, company details, email addresses, postal addresses, and fax numbers. We don't just rely on computers to check our email marketing lists for accuracy: We go through them routinely by hand, using real human authenticators to make sure that every bit of data we sell is usable. And at Bookyourdata.com, we're devoted to making sure that you get exactly the information that you need. That's why we don't just sell pre-built bulk email lists like this Germany email list. We also have a list-builder tool that you can use to easily make just the right business database for you, filtering sales leads by things like industry, location, or job title. See the difference a quality business contact list can make for your marketing campaign. Buy one of our lists today!